Churches are beautiful, even to those who do not subscribe to the sermons preached inside. Those who have spent the majority of their Sundays dressed in their best frocks and coats, and even those who have not, will recognize the serene quality of the air inside a chapel. The churches in Delhi are beautiful and deserve a visit. Perhaps you will find peace, maybe even get back a memory of yourself fidgeting with the hem of your dress, under the shadow of an arch. The spires and the stained glass do not require faith to be admired. Here is a list of the most beautiful churches in Delhi. Built-in 1836 by Col. James Skinner, the St. James Church near Kashmiri Gate in Delhi is an Anglican Church of great beauty and heritage. This church was attended by the Viceroy of India during the British rule and boasts of many relics. Foremost among them is the original European stained-glass windows. They depict the crucifixion, ascension of Christ as well as his resurrection. There is also an original painting by Italian painter Pompeo Batoni titled the ‘Prodigal Son’ as also a rare pipe organ. Emperor Akbar tried to create a state religion which incorporated the characteristics of Christianity, Hinduism, Islam, and Zoroastrianism into a new religion which he called Din-e-Illahi. He invited learned Catholic priests from Goa in 1578, who undertook their Catholic Mission with zeal and devotion. This led to the Tibet-Hindustan Mission in 1760 and helped Catholicism take roots in Delhi. This church was the second Catholic church built in Delhi, started in 1922 and completed in 1935. Its main altar is made of pure Carrara marble. The cathedral is home to schools for boys and girls on its land. St. Michael’s Church is one of the most attractive Catholic churches in Delhi, and definitely deserves a visit for its beauty and innovative architectural design. Masses are held in both English and Hindi and one may choose to attend either of them. 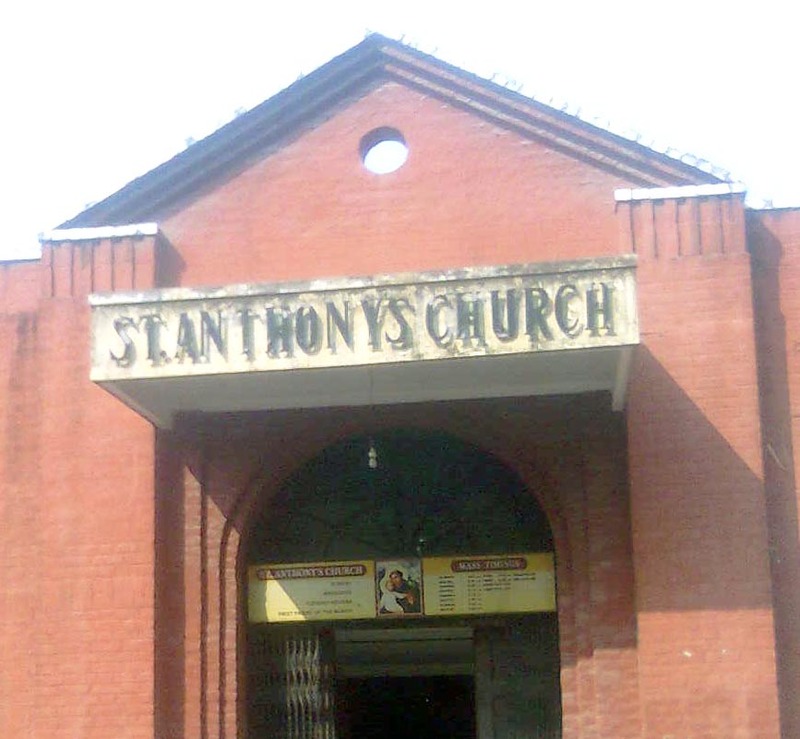 Also known as the Paharganj Church, St. Anthony’s Church is the third Catholic church built in Delhi, after St. Mary’s Church and Sacred Heart Cathedral. The church complex also holds a convent, two schools and an orphanage for girls. Initiated in 1917 by Rev. Fr. James, the project was completed 1949 by an Irish Capuchin Rev. Fr. R. P. Angelo. The church is built in a circular form, without any pillars in between and has the priest facing the congregation, in a first-of-its-kind design. St. Stephen’s Church was built in 1862, by the Society for the Propagation of the Gospel, on the Church Mission Road in Delhi opposite the old railway station in a Romanesque style of architecture. The church also uses a Catherine Window, following Gothic architectural style and was the first church ever to receive the martyr’s crown. The church is colored red in honor of the first Christian martyrs in India who died in 1857 as well as St. Stephen, the first Christian martyr and patron saint of the city. The foundation stone for this white-domed, Byzantine church was laid in 1904 by the widow of Alexander Maitland, who gave his life to the Delhi Mission and left it a bulk of his fortune. The church opened in 1905, and today the complex holds a primary school too. This is probably the only church in the world where Urdu is the language used for the sermonising and for the bible itself. The congregation is heavily influenced by Persian and they refer to fasts as Roza, service as namaz and prayers as dua. They salaam one another and hail Jesus (Yesu) with a Jai. This famous church in Delhi is very close to the Rashtrapati Bhavan. It was designed by Henry Madd to remain cool and serene at all times, even if the weather is exceptionally hot. A visit to the cathedral is an undeniably spiritual experience, with its curved, high arches. Located in Vasant Kunj amidst pastoral surroundings, this church is a great piece of architecture which amazes with its glory. Prayers come easily in this hallowed space to a visitor, who will not fail to be enthralled by the sculptures and carvings which speak of tales from the Bible. Services here are offered in the usual English and Hindi, but when requested, they will be offered in Korean too. So, go on and enjoy the unique atmosphere and bob homie of this church. This is another Roman Catholic church built in 1979 on a vacant residential plot in the Defence Colony. The church holds service not just in Hindi and English but also Malayalam, the language of Kerala, helping to bring the different communities in the locality together. Built in the RK Puram area of Delhi in 1972, with the generous financial support of the residents of Cologne in West Germany, this Church is made conspicuous by the red bricks used for its construction. Its architecture is reminiscent of the Mughal style, in keeping with the surrounding buildings in the area. This imposing and elegant edifice attracts people of all faiths irrespective of their social and economic backgrounds. This beautiful Catholic church is located in Pushp Vihar and is one of the new but popular churches in Delhi. Inaugurated in 1998, this church offers a great ambiance as well as delightful surroundings. This church caters to over 700 families in its parish and attracts visitors of other faiths too. One of the largest of MCI churches in India, the Centenary Methodist Church in South Delhi was built in 1956 in a sprawling 1.27 acre of land. The church offers a Sanctuary, Parish Hall and an educational unit for Sunday school. You will find both Hindi and English congregations here, with regular morning services on Sundays with Sunday school. The church also conducts youth and women’s fellowships, and grants scholarships to needy students to pursue higher studies. Located in Chandni Chowk, this church is a fine example of European architecture. The use of heavy circular columns to support a large colonnaded porch on the south side of the construction stands testimony to its heritage and history. It is one of the oldest churches in Delhi, built in 1860 after the Sepoy Mutiny resulted in the disbanding of the first Baptist congregation in Delhi. Also known as the Mother Church, the church has produced many reverends, preachers, and pastors. The church also retains many of the original motifs and carvings, to this day; though its roof needed replacement. You will find this simple but very popular church on Sri Aurobindo Marg. It is justly famed for the quality of its mass, choir, and maintenance. Members of this church are very active and the surroundings are maintained with a high level of artistic standards, drawing a great deal of appreciation. The service is held in both English and Hindi. The church was founded in 1723 but was destroyed during Nadir Shah’s attacks on Chandni Chowk and the resulting massacres. It was rebuilt as a small church in 1746. The present building housing St. Mary’s Church was built in 1865, mainly through the efforts of Fr. Keegan. St. Mary’s Church met the spiritual needs of the British Army garrisoned at the Red Fort as well as the Railway and P&T departments. The church was renovated in 1965 and stands with dignity is a major place of worship for Catholics in the city and also as a major landmark in the Historic Old Delhi. Kerala is the first State in India where many people converted to Syrian Christianity. With the influx of many of them into Delhi about the time India attained independence, there was a need for a Church which catered to their need for their mode of worship and traditions. Holy Qurbana was conducted in Delhi even in 1942, but it was in 1953, that the Syrian Christians living in Delhi formed their own parish and established a diocese for themselves in 1976, which was later renamed St. Mary’s Orthodox Cathedral. In a secular country like India, one may belong to a specific religion but few would hesitate to visit any house of prayer, whether it is a church, temple, synagogue or dargah. If you agree with this observation, go ahead and take advantage of these famous churches in Delhi, and visit them to enjoy their architecture, ambiance and outstanding beauty.